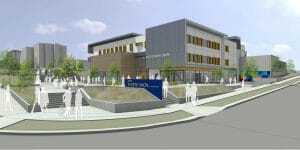 Seaside, CA – March 21, 2017 – Gilbane Building Company, a nationally recognized leader in construction, has been selected by California State University at Monterey Bay for the design-build of a new student union facility. This project is being designed to serve as both a gateway and key circulation artery between the transportation hub and center of the campus. The student union will house activity spaces, meeting rooms, lounges, dining amenities, a bookstore, retail spaces, and student government/organization, administrative and support spaces. The project is unique in that it is funded almost entirely through student fees and is already benefitting from significant student participation which will continue through the full duration of the project. A project specific Facebook page was established at the onset of the project to help the students engage with the process and monitor project progress. As part of the campus’s continuing commitment to sustainability, the project will pursue both LEED and Living Building Challenge Petal certifications. Gilbane provides a full slate of construction and facilities-related services – from pre-construction planning and integrated consulting capabilities to comprehensive construction management, close-out and facility management services – for clients across various markets. Founded in 1873 and still a privately held, family-owned company, Gilbane has more than 50 office locations worldwide. For more information, visit www.gilbaneco.com.